Joey O’Hare first trained at the Ballymaloe Cookery School in Cork, and later at Westminster Kingsway College in London whilst working under Alexis Gauthier at Rousillion. Ballymaloe’s setting on an organic, biodynamic farm, with a very tangible field-to-table reality, has had the greatest influence on Joey’s cooking, even ten years later. Her food is seasonal and veg-centric, and incorporates plenty of cultured foods; Joey believes that the complexity of flavour which fermented foods present is the key to good vegcentric cooking. Joey has worked as a chef for ten years, both in London restaurants and in private homes across the UK and abroad. 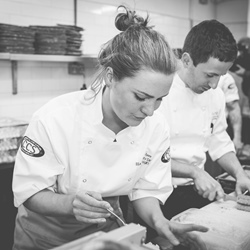 She seeks out the best regional produce wherever she goes, particularly in Berkshire where she spends much time working as a private chef and coordinating the estate’s kitchen garden. Following her appearance on Masterchef the Professionals in 2015 she has launched Hare on the Hill, a veg-centric supper club in London, where menus are always directly inspired by weekly trips to the farmers’ market at Herne Hill; Hare on the Hill has been shortlisted for a Young British Foodie Award for its work with vegetables. Joey’s latest project, Food with Time, explores ideas of sustainability within the food and farming industries, as well as the importance of a seasonal, veg-centric diet for both the environment and the individual. Food with Time also celebrates and showcases the art of preserving the best of the season through fermentation, with cooking videos and demonstrations on YouTube.